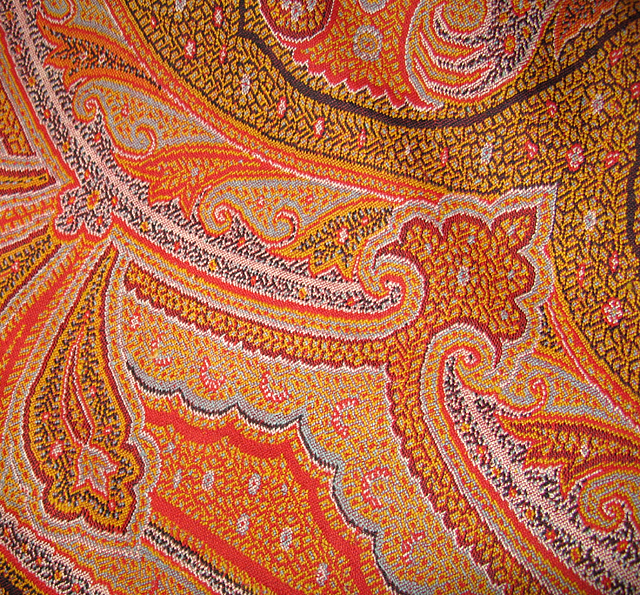 Paisley prints were popular in the 60’s (or was it the 70’s?). You remember them (at least those of you my age! ); they are the colorful and complex teardrop patterned prints. Wednesday, we visited Paisley Scotland, namesake of the pattern and learned their history. The history of this pattern goes back at least t 3,000 years to Babylon, where the shape (a teardrop with a bent-over tip) can be found in Tree of Life artwork. The date palm was the tree of life and the shape is derived from the shape of an young, unfolding palm frond. In the 1800’s, shawls with this pattern became popular in Victorian England. These shawls were woven, not printed, requiring amazingly complex weaving looms. Although the shawls were originally produced in Edinbourgh, Paisley, near Glagow eventually became the center of production for the shawls and they became known as Paisley shawls. The name eventually stuck to the pattern itself. [continued 19.04.08] The Paisley Museum is a rich source of information on the history of the Paisley shawls, including their history, displays of many shawls and–at least for those in our weaving oriented tour–a chance to get up close with the large and complex Jacquard looms. 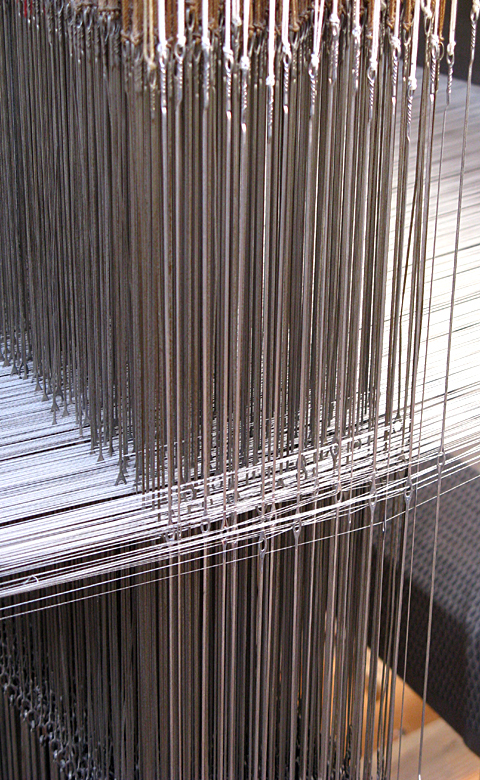 These are hard to describe in a short space, but these were automatically controlled looms, with a series of punch cards that controlled individual warp threads. In a sense, each thread could be individually programmed, rather than being controlled in a bank with a bunch of other threads. As a result, these looms, although difficult to set up because of their complexity, could then mass produce the Paisley shawls. I was there long enough to figure out (with the help of Kathy, a self-described weaving equipment freak) how they worked. You may have noticed that some of my language sounds computerish: programming, punch card. This is no accident. 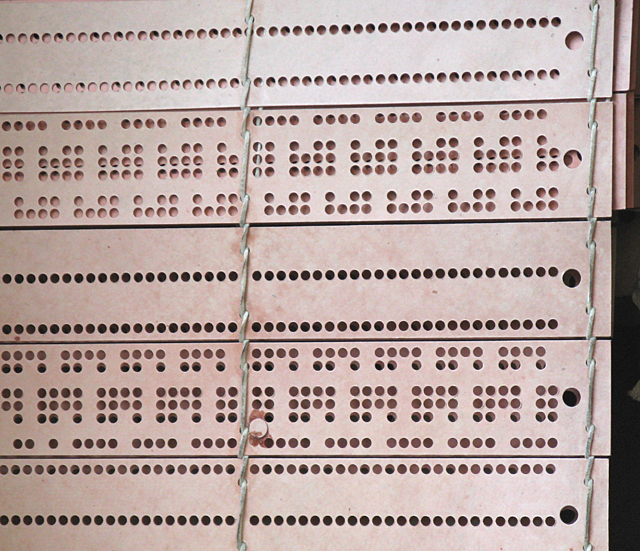 These punch card Jacquard looms were the basis for early computers.